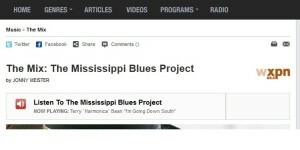 Check out The Mississippi Blues Project Music Mix online stream, from NPR Music! I picked out some great tracks from artists from Mississippi as well as some interview segments with the artists, and clips from the 2012 film “We Juke Up In Here” – – artists include B. B. King, Elmore James, R. L. Burnside, Junior Kimbrough, Muddy Waters, Howlin’ Wolf, J. B. Lenoir, Johnnie Temple, Jimmy Reed, Robert Johnson, Denise LaSalle, Willie Dixon, The North Mississippi AllStars, Arthur “Big Boy” Crudup, and many more, including all six of the artists performing in Mississippi Blues Project concerts: Cedric Burnside, Big George Brock, Terry “Harmonica” Bean, Jimmy “Duck” Holmes, Robert Belfour, Big A and The Allstars, Super Chikan, and The Homemade Jamz Blues Band.